Highly pigmented and creamy in 18 skin-true shades, the Revolution Pro Full Cover Camouflage Foundation creates maximum coverage with an even, natural-looking finish. WaterProof, no-transferable and long-wearing. About the Brand : Introducing the Professional Makeup Range from the creators of Revolution Beauty.Aimed for professional makeup artists and beauty lovers worldwide, the new Pro range from Makeup Revolution London offers comprehensive range of Professional Makeup Products, Palettes, Eyebrow Pomade, Makeup Brushes, Lipsticks, along with face makeup products at affordable prices.While majority of the products are Vegan, these products are 100% cruelty free and free from animal testing. Explore the entire range of Foundation available on Nykaa. 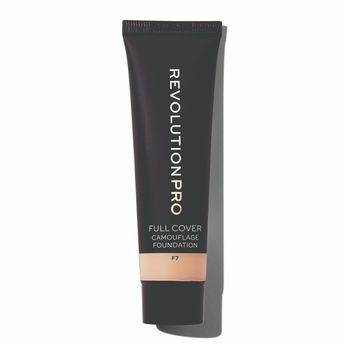 Shop more Revolution Pro products here.You can browse through the complete world of Revolution Pro Foundation .Alternatively, you can also find many more products from the Revolution Pro Full Cover Camouflage Foundation range.